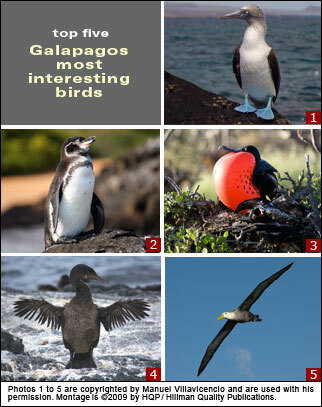 Criteria: Level of interest among sophisticated Galapagos travelers. These Galapagos residents are world famous for their bright blue web feet (see photo above). During the courtship dance, the male blue-footed booby comically raises his feet up and down, alternating between the two. He's showing off how blue his feet are (the deeper the blue, the greater the woo). Blue-footed boobies catch fish by plunge-diving into very shallow shore water. This spectacular and seemingly perilous feat captivates visitors. Most Galapagos islands, but best bets are Espanola, Fernandina, Isabela, and North Seymour. This is one of the world's shortest of penguin species and it is the only one found north of the equator. Galapagos penguins nest in niches in rocky coastal lava cliffs - and spend their out-of-the-water time living on those protective formations. Sometimes these flightless aquatic birds intermingle with snorkelers. Bartolome (at Pinnacle Rock), Fernandina and Isabel. Males inflate their bright-red throat pouch (see photo above) to attract and seduce females. The bird was aptly named after the frigate ship, a fast vessel used by pirates. Reason: The frigatebird hijacks the food of other birds in mid air. It has enviable aerial maneuverability despite its broad wingspan. There are two main species: Magnificent and Greater. Genovesa, North Seymour, and San Cristobal.